IN OCTOBER 2008 I attended and captured 82 pages of sketchnotes An Event Apart in Chicago - one of my early, formative sketchnote experiences. I had a great time, and ever since, I've wanted to attend and sketchnote AEA again — but timing with my schedule just never worked out — until this year. 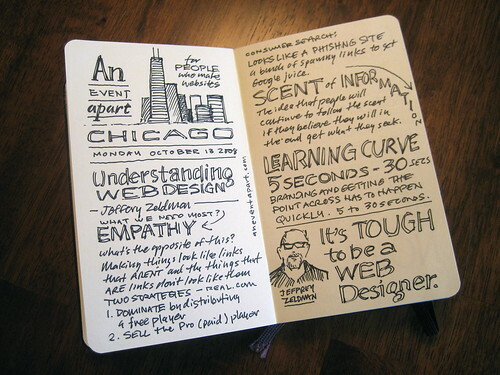 I'll be attending An Event Apart 2011 in Minneapolis next week (August 7-9), invited by the Godfather of Web Standards, Jeffrey Zeldman to capture sketchnotes. I'm very curious to see how the messages of the speakers have changed since 2008. If you're at AEA next week, come on over and say hello.